Anhydrous ethanol production via Molecular Sieve uses tanks with rigid controls for pressure and temperature, filled with ceramic particles, traditionally known as 'resin'. Through minerals called zeolites, which are capable of selective adsorption, the 'resin' retains the water molecules and allows the passage of ethanol molecules. In this manner, the ethanol starts the process with 6.7% humidity and exits with only 0.4%. With the utilization of the Molecular Sieve, there is no use of any chemical input in the dehydration process, which provides for a final product with no chemical traces foreign to ethanol fermentation. This type of ethanol is used in mixture with gasoline, as well as in more demanding applications, such as pharmaceutical, chemical, and food industries. From the 1940s up to the present, many still use azeotropic distillation technology for dehydration of ethanol which utilizes dangerous chemical products, such as benzol and cyclohexane. Through the use of the molecular sieve, there is an operational cost reduction due to the lesser use of steam, approximately 30% compared to the azeotropic process. This reduction in steam consumption makes possible a higher production of ethanol or sugar and allows for the production of anhydrous ethanol in some industrial units with limited boiler capacity. Automation is another favorable point of the installation. Advanced instrumentation and a complete supervisory system (in real time) allow total process control. 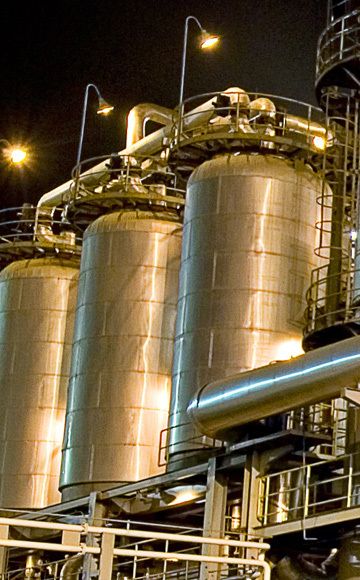 To summarize, the principal advantages to this technology are: elimination of the chemical dehydrating agents of traditional distillation; finished product graded higher than 99.5 INPM; production of anhydrous ethanol without contaminants and of a higher quality; totally automated production through a supervisory system; lower steam and industrial water consumption; increase in capacity of units; average useful life of dehydrating agent of 8 years; ecological dehydrating agent which permits a sustainable production. Currently, all anhydrous ethanol in the two units of Renuka do Brasil is produced with this technology, whose production performance reaches 750m³/day of anhydrous ethanol at Mill Madhu and 850m³/day at Mill Revati.